Your menopause herbal treatment is something that can save your sanity and perhaps your marriage : ) There is so much you can do for your natural menopause treatment. Hormone replacement therapy comes with huge risks, so try a natural treatment for menopause herbal first. There are many natural herbs that can help hormonal imbalance in women. Many have heard of using black cohash as a natural treatment for menopause. it does work wonders. I always thought that by living a very healthy lifestyle and eating a healthy diet that I would never suffer from any menopause symptoms. However I did start having hot flashes, especially at night which disturbed my sleep a few times per night. I was not a happy camper. I was used to sleeping straight through the night, now I was waking up, sometimes having a hard time falling back to sleep and feeling tired when I woke up and during the day. This would never do! I was used to being up and full of energy from morning until night. I took a menopause herbal treatment of time released black cohash combined with dong quai. The hot flashes stopped right away and I slept like baby, never to experience any more hot flashes! 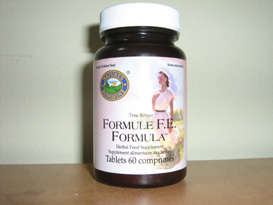 This is an amazing product called F.E. Formula, for Flash Ease Formula. I have used it to help so many of my clients as well. The key is, that the black cohash is time released so it helps alleviate symptoms for 8 hours, unlike other supplements that don't work or work only very short term. contact me to learn how to order it and receive 30 to 40% off the normal retail price. If your liver is overworked or you are suffering from adrenal exhaustion you may need more than one supplement for your menopause herbal treatment. Everybody is different. You need to figure out the cause of your symptoms of menopause in order to find the right remedy for you. Usually you are not getting hot flashes because estrogen is high or low it’s because estrogen fluctuates. Everyone reacts differently when it comes to hormonal imbalance. Black cohash works so well because it balances out these fluctuations. The following are some of the most effective herbs for a natural treatment for menopause. Please note that this list is far from comprehensive. In working with my clients as a Naturopath we go in depth to find the best remedies that work for each person. Please note that flax seed oil can go rancid quickly. Always buy good quality, make sure it is a fresh as possible and keep it in the fridge. Anise, fennel, licorice root, raspberry, sage, unicorn root, are natural estrogen promoters. Note, do not take licorice for more than seven days in a row and do not take it if you have high blood pressure. Gotu kola and red clover as well as black cohash, and dong quai relieve hot flashes, vaginal dryness and depression. I can not believe it when I talk to women who tell me they suffered for years with hot flashes, night sweats, mood swings, depression, bloating and more. I know first hand through my own experience and in working with my clients as a Naturopath, almost all symptoms can be alleviated using a menopause herbal treatment. Please do not suffer any longer. Contact me to find some balance and live your life free of any menopausal symptoms. 2. Balch, A. Phyllis. CNC Prescription for Nutritional Healing, Fourth Edition (New York: Penguin Group, 2006) 36.